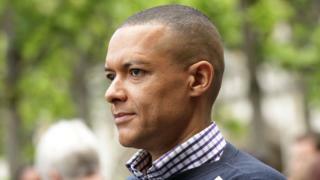 Labour MP Clive Lewis has been cleared of sexual harassment by a party inquiry, the BBC understands. The Norwich South MP was put under investigation last month after a party supporter claimed that she had been groped by him at the Labour conference in Brighton in September. Mr Lewis, the former shadow defence secretary, had always denied the allegation. He said: "I am very pleased to be able to put this behind me and move on." He added: "I believe it right and proper that the Labour Party treats all allegations of bullying, harassment and sexual misconduct seriously. "I want to express my gratitude to my wife, friends and constituents who have supported me during recent weeks." The Labour Party launched its investigation into Mr Lewis after an unnamed woman told the Independent newspaper that he had groped her. At the time, Mr Lewis told the BBC he was "vigorously" disputing the allegation, which he said he had been "pretty taken aback" by. Announcing the conclusion of the case, a Labour Party spokesman said: "After consideration of statements provided by the complainant and the respondent, the National Executive Committee's sexual harassment panel has ruled that on the balance of the evidence the matter should not be referred to a full hearing of the National Constitutional Committee."